Background: Bone remodeling is a biologic process involving an acute inflammatory response in periodontal tissues during orthodontic tooth movement. The early response of periodontal tissues to mechanical stress involves metabolic changes that allow tooth movement. Aim of the Study: The aim of the present study was to evaluate the changes in alkaline phosphatase (ALP) and lactate dehydrogenase (LDH) enzyme activity in gingival crevicular fluid (GCF) when forces are applied during initial alignment (P1) and retraction (P2). Settings and Design: The study was performed in a hospital-based population with an experimental design. Materials and Methods: Seventeen participants (11–21 years) included in the study, all requiring 1st premolar extractions were undergoing fixed orthodontic treatment. Maxillary canine and mandibular 2nd molar were used as test tooth (TT) and control tooth (CT) in each patient, respectively. On 14th day after start of each phase, 2 μL of GCF was collected from mesial side of both TT and CT for ALP and LDH activity determination using spectrophotometer. Statistical Analysis: Statistical analysis was performed with SPSS (version 13, SPSS Inc., Chicago, USA) package. The significance of differences in both phases at test or, at control site for LDH and ALP enzyme activity was evaluated by performing student's paired t-test. The significance of differences in between test and control sites in each phase separately was evaluated by performing student's unpaired t-test. Results: There was a variation in enzyme activity during orthodontic tooth movement. At TT, there was statistically significant increase in ALP and LDH activity in P2 as compared to P1 with P = 0.005 and P ≤ 0.001, respectively. At CT, there was no statistically significant difference in ALP and LDH activity in P1 and P2 with P = 0.054 and P = 0.061, respectively. Conclusion: This study concluded that ALP and LDH activity could be successfully estimated in the GCF and ALP and LDH activity in GCF reflects the biologic activity in the periodontium during orthodontic tooth movements. Bone turnover during orthodontic tooth movement has been described as a continual and balanced process characterized by bone deposition at sites of tension and bone resorption at the sites of pressure. An important condition for the remodeling activities, and ultimately tooth displacement, is the occurrence of an acute inflammatory process., The early phase of orthodontic tooth movement, involves an acute inflammatory response, characterized by periodontal vasodilatation and migration of leukocytes out of the capillaries. A reflection of this phenomenon can be found in the gingival crevicular fluid (GCF) of moving teeth, where significant elevations in the concentrations of inflammatory mediators are seen. Alkaline phosphatase (ALP) is a glycoprotein and a membrane-bound enzyme. It hydrolyzes monophosphate ester bonds of nonorganic pyrophosphate at alkaline pH, increasing local concentrations of phosphate ions. In the periodontium, ALP is a very important enzyme as it is a part of the normal turnover of periodontal ligament, cementum, and bone homeostasis. The response of an organism to periodontal infections includes the production of several enzymes released from stromal, epithelial, inflammatory, or bacterial cells. These intracellular enzymes are released increasingly from the damaged cells of periodontal tissues into the GCF and saliva. Several enzymes that are evaluated for the early diagnosis of periodontal disease are ALP and acid phosphatase, lactate dehydrogenase (LDH), aspartate and alanine aminotransferases (AST and ALT), gamma-glutamyl transferase, and creatine kinase. LDH is an enzyme normally limited to the cytoplasm of cells and is released extracellularly, only after cell death. It is, also, proposed that in GCF, LDH activity is significantly correlated with gingival inflammation and tissue destruction from periodontitis. ALP and LDH enzyme activity in GCF reflects biologic activity in periodontium during orthodontic tooth movement.,, It is essential to investigate whether ALP and LDH activity could be used as diagnostic tool (as biomarkers) for monitoring orthodontic tooth movement in clinical practice. The aim of the present study was to evaluate the changes in ALP and LDH enzyme activity in GCF when forces are applied during initial leveling and alignment (Phase 1) and retraction (Phase 2) and to evaluate if these observations can be used in the future for the development of chairside tests for assessing the orthodontic tooth movement and in adjusting the forces used to achieve optimal results without leading to tissue insult and necrosis which actually delay the goals set for achieving desired results in orthodontic treatment. In the present study, ALP and LDH enzyme activity was assessed during orthodontic tooth movement in 17 participants (7 males and 10 females) randomly selected based on the inclusion and exclusion criteria with an age range of 11–21 years. The teeth selected were based on the fact that canines are the corner teeth in the arch and limit the transition from the anterior to the posterior teeth while the patients selected were with bimaxillary dentoalveolar protrusion and proclination, with minimal or no crowding. In the present study, mandibular 2nd molars were used as control. The study was divided into two phases: Phase 1 (P1): leveling and alignment and Phase 2 (P2): retraction. Two phases, Phase 1 (initial leveling and alignment) and Phase 2 (retraction), were selected at test and control sites for ALP and LDH enzyme activity to have the assay of the enzyme in different stages of orthodontic treatment and the impact of varying forces on the change in enzyme levels. The following inclusion criteria were used: patients requiring fixed orthodontic treatment; good general health; no use of anti-inflammatory drugs during the month preceding the study; probing depth values <3 mm in the whole dentition; and with no radiographic evidence of periodontal bone loss. Informed consents were obtained from the patients, or, the parents for minors, before the study, and the protocol was reviewed and approved by the Institutional Ethical Committee and Review Board. 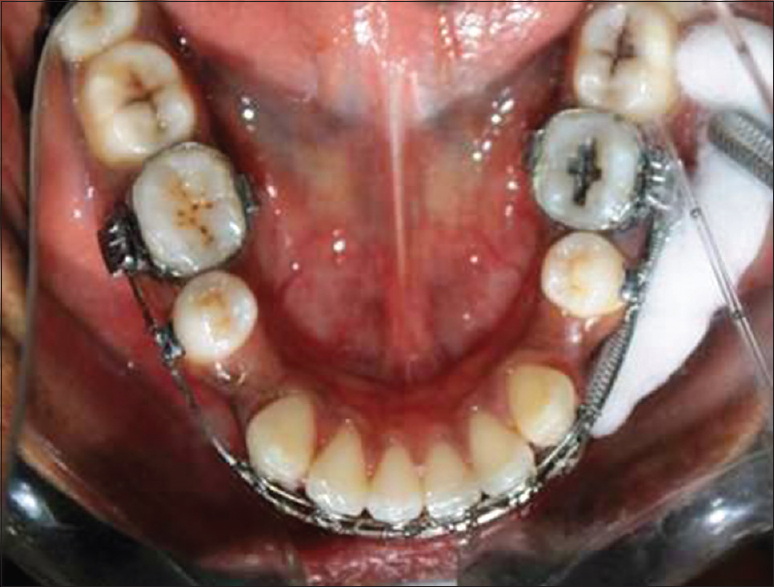 Orthodontic brackets (MBT, 3M UNITEK, Langenhagen, Germany) were placed on the upper and lower teeth. Bands were placed on the first molars. An active 016 NiTi wire (Arch wires®, Prime Orthodontics, Inc. Portland, U. S. A.) was then engaged for initial leveling and alignment (P1). Following leveling and alignment (P1), the retraction (P2) of the anterior as en masse was initiated on a working base wire of 019 × 025” stainless Steel preformed of standard arch form (Arch wires ®, G and H, Langenhagen, Germany). En masse retraction was performed, using Nitinol closed coil spring (8 mm) capable of delivering 150 g of constant force (Nitinol closed coil spring ®, Dentos, Daegu, Korea). In each patient, maxillary canine having fixed orthodontic appliance was used as the test tooth (TT) and mandibular 2nd molar, with no appliance, no orthodontic force, was used as control tooth (CT). On 14th day after start of each phase, 2 μL of GCF was collected from the mesial side of both TT and CT for ALP and LDH activity determination using spectrophotometer (Spectrophotometer ®, Trans-Asia Biomedical Ltd., Model Erba Chem-5 plus-v2, Lachema, Czech Republic). Before collecting GCF sample, clinical examination was done for pocket depth, bone loss, and oral hygiene using periodontal probe. Contamination of GCF sample was minimized by carefully cleaning the tooth surface with cotton pellets, collecting GCF sample from isolated areas. At the mesial side of the control [Figure 1] and test [Figure 2] teeth, GCF was collected for the ALP and LDH activity assay. Each crevicular site included in this study was isolated with cotton rolls. Before GCF collection, any supragingival plaque was removed with cotton pellets, and a gentle airstream was directed toward the tooth surface for 5 s to dry the area. Samples of GCF were obtained from predetermined sites by placing calibrated, volumetric, microcapillary pipettes with 0–5 μl range. The micropipettes were placed extracrevicularly at the entrance of the gingival crevice. Two microliters of GCF was collected from each subject. The pipettes contaminated with blood/saliva were discarded. The GCF was transferred into vials containing 100 μl phosphate buffer saline, and the samples were frozen at − 70°C till they were assayed for ALP and LDH. The GCF LDH and ALP enzyme activity was determined using spectrophotometer., For LDH enzyme activity, in the presence of LDH, pyruvate is reduced to L-lactate with the simultaneous oxidation of NADH. The rate of decrease in absorbance at 340 nm, representing the NADH consumed, is directly proportional to LDH activity in the sample. Results were converted into enzyme activity units and were expressed as international unit per liter (IU/L). For ALP enzyme activity, in the presence of ALP, p-Nitrophenyl phosphate is hydrolyzed liberating p-nitrophenol and phosphate ions at pH 10.4. The rate of p-Nitrophenol formation, measured photometrically, is proportional to the catalytic concentration of ALP present in the sample. The results obtained were converted into enzyme activity units and were expressed as IUL). The statistical package for Social Sciences program (SPSS) was used to perform the data analysis. Statistical analysis was performed with SPSS (version 13, SPSS Inc., Chicago, USA) package. Data regarding GCF LDH and ALP enzyme activity were presented as mean ± standard deviation. The significance of differences in both phases at test or, at control site for LDH and ALP enzyme activity was evaluated by performing student's paired t-test. The significance of differences in between test and control sites in each phase separately was evaluated by performing student's unpaired t-test. The mean GCF ALP enzyme activity in IU/L was 35.36 ± 17.32 in the TT and 33.31 ± 10.23 in CT in Phase 1 (P1) while 54.69 ± 25.75 in TT and 40.44 ± 13.17 in CT in Phase 2 (P2) [Table 1]. The mean GCF LDH enzyme activity in IU/L was 40.21 ± 27.56 in the TT and 27.29 ± 18.67 in CT in P1 while 57.58 ± 28.50 in TT and 37.21 ± 13.38 in CT in P2 [Table 2]. At the TT, the values for mean ALP were found to be 35.36 ± 17.32 IU/L and 54.69 ± 25.75 IU/L in P1 and P2, respectively, and the difference was found to be statistically significant in the form of increase in the mean test ALP activity in P2 (54.69 ± 25.75 IU/L) when compared to P1 (35.36 ± 17.32 IU/L) with t = 3.26 and P = 0.005 [Table 1] indicating that the mean ALP enzyme activity in GCF was increased in P2 as compared to P1 at TT. At CT, the corresponding values for ALP were found to be 33.31 ± 10.23 IU/L and 40.44 ± 13.17 IU/L in P1 and P2, respectively, and the difference was found to be statistically insignificant with t = 2.11 and P = 0.054 [Table 1]. In addition, there was no significant difference in mean P1 ALP activity between TT (35.36 ± 17.32 IU/L) and CT (33.31 ± 10.23 IU/L) with t = 0.4 and P = 0.69 [Table 1] even though the level of ALP in GCF was found to be elevated at the TT. Again, there was no significant difference in the mean P2 ALP activity between TT (54.69 ± 25.75 IU/L) and CT (40.44 ± 13.17 IU/L) with t = 2.03 and P = 0.053 [Table 1] even though the level of ALP in GCF was found to be elevated at the TT. In case of LDH, there was observed a statistically significant increase in the mean test LDH activity in P2 (57.58 ± 28.50 IU/L) when compared to P1 (40.21 ± 27.56 IU/L) with t = 5.39 and p=<0.001 [Table 2] indicating a rise in LDH enzyme activity in GCF in P2 as compared to P1 at TT. There was no significant difference, however, in the mean control LDH activity between P1 (27.29 ± 18.67 IU/L) and P2 (37.21 ± 13.38 IU/L) with t = 2.04 and P = 0.061 [Table 2]. In addition, no significant difference could be observed in the mean P1 LDH activity between TT (40.21 ± 27.56 IU/L) and CT (27.29 ± 18.67 IU/L) with t = 1.53 and P = 0.14 [Table 2] even though the level of LDH in GCF was found to be elevated at the TT. There was a statistically significant difference in mean P2 LDH activity, however, between TT (57.58 ± 28.50 IU/L) and CT (37.21 ± 13.38 IU/L) with t = 2.68 and P = 0.012 [Table 2] indicating that there was increase in LDH enzyme activity in GCF at TT as compared to CT in P2. Tooth movement by orthodontic treatment is characterized by remodeling changes in dental and periodontal tissues including dental pulp, periodontal ligament, alveolar bone, and gingiva. Prolonged application of mechanical forces that exceed the bioelastic limits of tooth-supporting structures represents a physical agent capable of inducing an inflammatory reaction in the connective tissues leading to adaptive proliferation and remodellng, mainly in the periodontal ligament and alveolar bone., Overcompression results in ischemia, interruption of nutrition and cell death with an almost unavoidable formation of a necrotic or, hyalinized zone, which temporarily arrests tooth movement. The vascular changes are not confined only to the periodontal ligament, but encompass, also, the alveolar bone, whereby proliferation of blood vessels and blood-borne cells resorb the bone tissue behind the hyalinized area. The necrotic periodontal structures are potent inflammatory stimuli leading to blood vessels and cell proliferation in the surrounding areas, with removal of the hyalinized structures and subsequent tissue repair., In a healthy gingival crevice, the initial fluid accumulated is a transudate of interstitial fluid, whereas under inflammatory conditions, an exudate starts accumulating. This fluid is called GCF. As this fluid traverses from the host microcirculation, through the tissues and into the gingival sulcus or, pocket, it captures mediators involved in the destructive host response and byproducts of local tissue metabolism. In the periodontium, ALP is a very important enzyme as it is part of the normal turnover of periodontal ligament, cementum, and bone homeostasis. It is produced by many cells, including fibroblasts, osteoblasts, and osteoclasts; however, the main source of ALP in GCF is neutrophils. Bone-forming cells are shown to have ALP activity, and changes in this enzyme in serum and bone have been used as markers for bone metabolism in several diseases. Elevation of ALP in GCF could well-reflect changes of alveolar bone in localized areas. Activity of LDH in GCF is significantly correlated with gingival inflammation and tissue destruction from periodontitis. With the consideration that LDH is an index of tissue destruction and that, during orthodontic tooth movement, phenomena such as cell necrosis, have been described, an increase in LDH activity in the GCF can be hypothesized., GCF component analysis is a noninvasive method for studying the cellular response of the underlying periodontal ligament during orthodontic treatment., In the present study, ALP and LDH enzyme activity was assessed during orthodontic tooth movement in 17 subjects. The teeth selected were based on the fact that canines are the corner teeth in the arch and limit the transition from the anterior to the posterior teeth while the patients selected were with bimaxillary dento-alveolar protrusion and proclination, with minimal or no crowding. In the present study, mandibular 2nd molars were used as control. Two phases, Phase 1 (initial leveling and alignment) and Phase 2 (retraction), were selected at test and control sites for ALP and LDH enzyme activity to have the assay of the enzyme in different stages of orthodontic treatment and the impact of varying forces on the change in enzyme levels. The present study showed that there is statistically significant difference in mean ALP and LDH enzyme activity at test and control site during Phase 1 and Phase 2. For ALP at test site, there was statistically significant increase in ALP enzyme activity in Phase 2 as compared to Phase 1 (P = 0.005). This indicated that there was an increase in level of ALP enzyme activity during retraction as compared to initial leveling and alignment. At control site, there was no statistically significant difference in ALP enzyme activity in Phase 1 and Phase 2 (P = 0.054). This indicated that there was no change in the level of ALP enzyme activity during retraction and initial leveling and alignment. For LDH, at test site, there was statistically significant increase in LDH enzyme activity in Phase 2 as compared to Phase 1 (P =<0.001). This indicated that there was an increase in the level of LDH enzyme activity during retraction as compared to initial leveling and alignment. At control site, there was no statistically significant difference in LDH enzyme activity in Phase 1 and Phase 2 (P = 0.061). This indicated that there was no change in the level of LDH enzyme activity during retraction and initial leveling and alignment. The results of the present study were in accordance with the studies conducted previously wherein an important number of GCF constituents have been studied in relation to the events taking place during orthodontic tooth movement including ALP, LDH,, osteocalcin,, cystatins and cathepsin B, Interleukin (IL)-1beta, IL-6, tumor necrosis factor-alpha, epidermal growth factor and beta 2-microglobulin, acid and ALP, tumor necrosis factor alpha, transforming growth factor-beta 1, glycosaminoglycans , and aspartate aminotransferase. These markers in the GCF have been found to be significantly elevated in the teeth undergoing orthodontic movement as compared to the untreated controls indicating the level of tissue stress and activity seen in those phases. Using mandibular second molar as the TT might have been a limitation of the study as another design would have been to consider harvesting GCF from the TT that had an orthodontic appliance while using an antagonist same tooth with no appliance and so, no orthodontic force as the CT. The results of the present study concluded that ALP and LDH enzyme activity in GCF is affected by orthodontic forces (P values significant) that cause bone remodeling and also, might be influenced by factors other than mechanical stress, for example, gingival inflammation, occlusal forces, oral hygiene of participants as suggested by the results from control. However, if gingival inflammation is kept under control, ALP and LDH activity in GCF can be considered a suitable indicator of the biologic effects produced by orthodontic treatment. Changes in the enzyme levels can, therefore, help a guided orthodontic treatment, especially, in the application of the required forces to bring tooth movement as excessive forces given during the treatment, also, could lead to necrosis and retard the completion of treatment goals by leading to overcompression of tissues that results in ischemia, interruption of nutrition, and cell death with an almost unavoidable formation of a necrotic or, hyalinized zone, which temporarily arrests tooth movement. With the consideration that the said enzymes are an index of tissue activity and destruction and that, during orthodontic tooth movement, phenomena such as cell necrosis, have been described in the periodontal ligament, any change in the enzyme activity in the GCF can be considered to be a noninvasive indicator of the proceedings of the treatment measures done toward attaining the desired and/or, expected outcomes. Further studies, targeting large sample size, different duration for the collection of GCF, different appliances with longitudinal data, however, are mandated for a better insight and understanding of the role of the said enzymes during orthodontic tooth movements. Perinetti G, Paolantonio M, D'Attilio M, D'Archivio D, Tripodi D, Femminella B, et al. Alkaline phosphatase activity in gingival crevicular fluid during human orthodontic tooth movement. Am J Orthod Dentofacial Orthop 2002;122:548-56. Serra E, Perinetti G, D'Attilio M, Cordella C, Paolantonio M, Festa F, et al. Lactate dehydrogenase activity in gingival crevicular fluid during orthodontic treatment. Am J Orthod Dentofacial Orthop 2003;124:206-11. 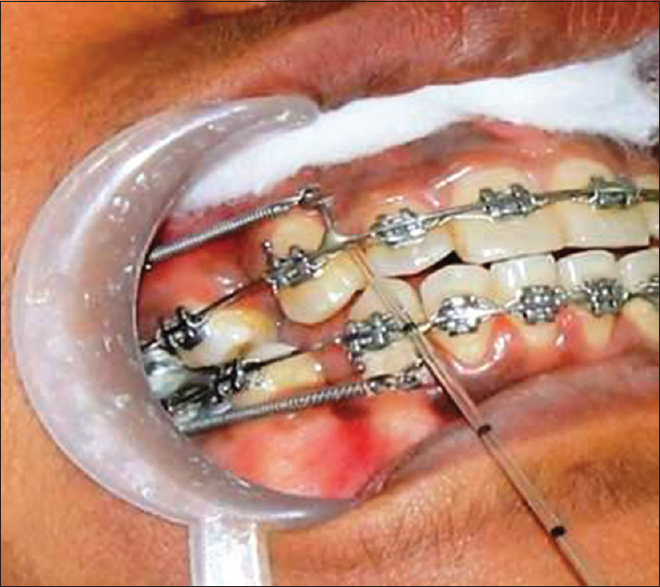 Gurton AU, Akin E, Sagdic D, Olmez H. Effects of PGI2 and TxA2 analogs and inhibitors in orthodontic tooth movement. Angle Orthod 2004;74:526-32. Nakashima K, Roehrich N, Cimasoni G. Osteocalcin, prostaglandin E2 and alkaline phosphatase in gingival crevicular fluid: Their relations to periodontal status. J Clin Periodontol 1994;21:327-33. Perinetti G, Serra E, Paolantonio M, Bruè C, Meo SD, Filippi MR, et al. Lactate dehydrogenase activity in human gingival crevicular fluid during orthodontic treatment: A controlled, short-term longitudinal study. J Periodontol 2005;76:411-7. Griffiths GS. Formation, collection and significance of gingival crevice fluid. Periodontol 2000 2003;31:32-42. Bowers GN Jr. McComb RB. A continuous spectrophotometric method for measuring the activity of serum alkaline phosphatase. Clin Chem 1966;12:70-89. Lamster IB, Hartley LJ, Oshrain RL. Evaluation and modification of spectrophotometric procedures for analysis of lactate dehydrogenase, beta-glucuronidase and aryl sulphatase in human gingival crevicular fluid collected with filter-paper strips. Arch Oral Biol 1985;30:235-42. King GJ, Archer L, Zhou D. Later orthodontic appliance reactivation stimulates immediate appearance of osteoclasts and linear tooth movement. Am J Orthod Dentofacial Orthop 1998;114:692-7. Choy K, Pae EK, Park Y, Kim KH, Burstone CJ. Effect of root and bone morphology on the stress distribution in the periodontal ligament. Am J Orthod Dentofacial Orthop 2000;117:98-105. Murrell EF, Yen EH, Johnson RB. Vascular changes in the periodontal ligament after removal of orthodontic forces. Am J Orthod Dentofacial Orthop 1996;110:280-6. Hellsing E, Hammarstrom L. The hyaline zone and associated root surface changes in experimental orthodontics in rats: A light and scanning electron microscope study. Eur J Orthod 1996;18:11-8. Griffiths GS, Moulson AM, Petrie A, James IT. Evaluation of osteocalcin and pyridinium crosslinks of bone collagen as markers of bone turnover in gingival crevicular fluid during different stages of orthodontic treatment. J Clin Periodontol 1998;25:492-8. Rhee SH, Kang J, Nahm DS. Cystatins and cathepsin B during orthodontic tooth movement. Am J Orthod Dentofacial Orthop 2009;135:99-105. Uematsu S, Mogi M, Deguchi T. Interleukin (IL)-1 beta, IL-6, tumor necrosis factor-alpha, epidermal growth factor, and beta 2-microglobulin levels are elevated in gingival crevicular fluid during human orthodontic tooth movement. J Dent Res 1996;75:562-7. Insoft M, King GJ, Keeling SD. The measurement of acid and alkaline phosphatase in gingival crevicular fluid during orthodontic tooth movement. Am J Orthod Dentofacial Orthop 1996;109:287-96. Lowney JJ, Norton LA, Shafer DM, Rossomando EF. Orthodontic forces increase tumor necrosis factor alpha in the human gingival sulcus. Am J Orthod Dentofacial Orthop 1995;108:519-24. Uematsu S, Mogi M, Deguchi T. Increase of transforming growth factor-beta 1 in gingival crevicular fluid during human orthodontic tooth movement. Arch Oral Biol 1996;41:1091-5. Last KS, Donkin C, Embery G. Glycosaminoglycans in human gingival crevicular fluid during orthodontic movement. Arch Oral Biol 1988;33:907-12. Samuels RH, Pender N, Last KS. The effects of orthodontic tooth movement on the glycosaminoglycan components of gingival crevicular fluid. J Clin Periodontol 1993;20:371-7. Perinetti G, Paolantonio M, D'Attilio M, D'Archivio D, Dolci M, Femminella B, et al. Aspartate aminotransferase activity in gingival crevicular fluid during orthodontic treatment. A controlled short-term longitudinal study. J Periodontol 2003;74:145-52.